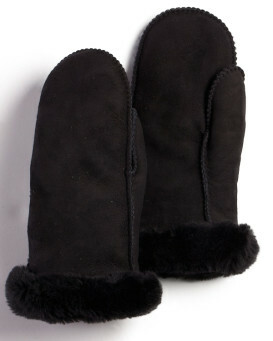 I have owned several pairs of shearling mittens and these are by far made the best. I spent a little more for these and they are extremely warm as they only have one large seam rather than pieced together like some cheaper options. Plus the shearling color, in this case black, does not come off on my hands as previous mittens I've owned have. Love them! Now just have to try not to lose them! a fine product. first bought medium size but it was larger than expected. now have received the small size. it's an 85% fit. will keep it because it is the better of the two. mitten sizes, obviously, can be a little problematic, depending on customer's preference. I don't know how warm they are. I live in Tucson, Arizona and am planning on going to Warsaw Poland. I expect I would be giving a better review after I tried them on in cold weather. I also bought a pair of black mittens for my husband at the same price. His seem thicker and heavier than mine. These mittens are awesome. Our winter has been harsh with many days below 0. The mittens kept my hands super warm. While sledding with the kids my hands actually got sweaty. The sheepskin is soft and the fur is warm and thick. Definitely worth the money. My shearling mittens arrived and I'm very pleased with them. They're exactly what I was hoping to receive. Your service was top of the line. All went smoothly when I had to return my napa leather mittens to replace them with my shearlings. Thank so much! Love the mittens. I work as a school crossing guard and with temps in the single digits off and on and windy conditions too, I am so happy to have something that allows my fingers to be warm. This company has been great with a faster ship date than they stated. Would love to get something else!! Beautifully made shearling mittons. High-quality shearling and no skimping on construction. I'd expect to pay at least $20 (US) more. Haven't worn them yet, but am impressed. I love these mittens. They are gorgeous and wonderfully warm. In fact, this is my second pair. But I almost didn't buy the second pair because the price has increased so much in the last two years. Very Happy with my new mittens. Materials are of high quality.Delivered in time for Christmas. Will purchase again from this company. Beautiful, cozy, warm mittens. They are just as I had hoped they would be. Fast shipping, too. Wonderful! When it's too cold for gloves, these mittens keep your hands toasty warm! The mitts are wonderfully warm and cosy. They came in plenty of time for Christmas. They were a high quality product snd a gift for my 21 year old daughter. She loved them. High quality. Would definitely recommend FurHatWorld. We live within 30 miles of the place that sets the record low's for the lower 48 states. These mits were designed with us in mind. Love 'em! The mittens are of high quality and keep my hands very warm while shoveling and dog walking. I will order more for other family members. Delivery was fast. Beautifully made mittens, perfect fit, and very warm. Look forward to a better winter now! These mittens are exactly what I was hoping they would be. Thick and warm shearling and great quality. I love them and recommend them to anyone who wants warm hands in the cold weather! So warm, just fabulous! As I remember mittens being when I was a kid! Lovely looking mitts. Might be warm. Will know more in a few weeks of winter. The mittens are gorgeous, the fur soft and warm, but i was disappointed that the cuffs are sewn down. I thought they were just folded down to display the lining. That makes for short gloves and a gap between coat sleeve and glove! I bought these mittens for my granddaughter for Christmas so, of course, have not yet had her reaction but I must say that I was very pleased with the quality and feel of them. I am always apprehensive when buying online as I don't do it very often but the transaction was smooth and delivered as promised. Here's hoping she is as pleased with them as I am. These are for my wife at Christmas. I tried them on when they arrived and I know they will fit her well. They cover a good bit of the wrist, too. The quality is excellent. They look and feel like top quality.